I know I know I know, I haven't been writing a lot lately! And I am sorry! The truth is that I have a full time job and 3 kids and a dog and I volunteer on the weekends, so I really don't have time! Ok, all the former is a total lie, but what do you want me to say? I have been busy. And I have to plan a wedding. Anyway, last week was Thanksgiving, which means that I gained the 4 pounds that I had lost over like 2 months. So all I want to eat now is low fat, low carb, low calorie food. I am obsesed with healthy food. I even started a pinterest board call healthy weeknight dinners, because even when I am in healthy mode, I refuse to give up taste and pleasure in food. I know this sounds like one of those Jenny Craig comercials, but the truth is that it is possible to enjoy low calorie food. 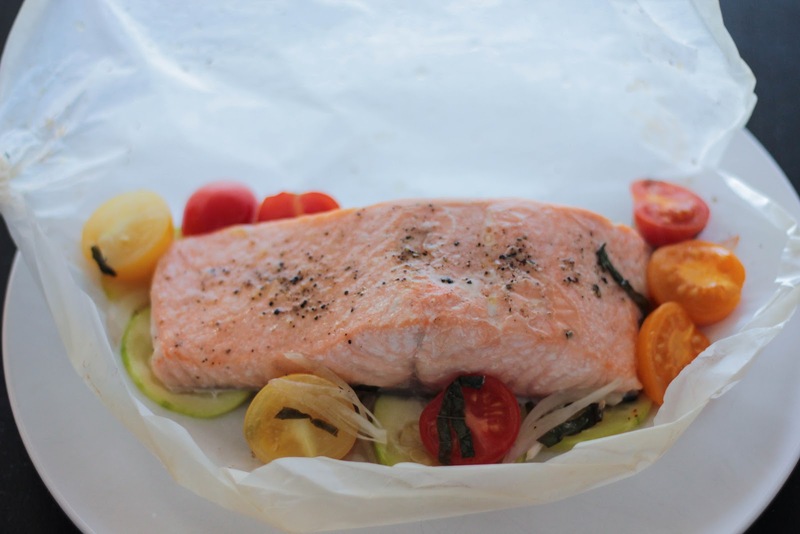 Although I don't think I will completely stop making cupcakes or ice cream, this coming year I am going to try to cook healthier than I usually do...you know, we have to look skinny on our big day, says Vogue and all..
On my trip to Spain 3 weeks ago, my mom made salmon en papillote. 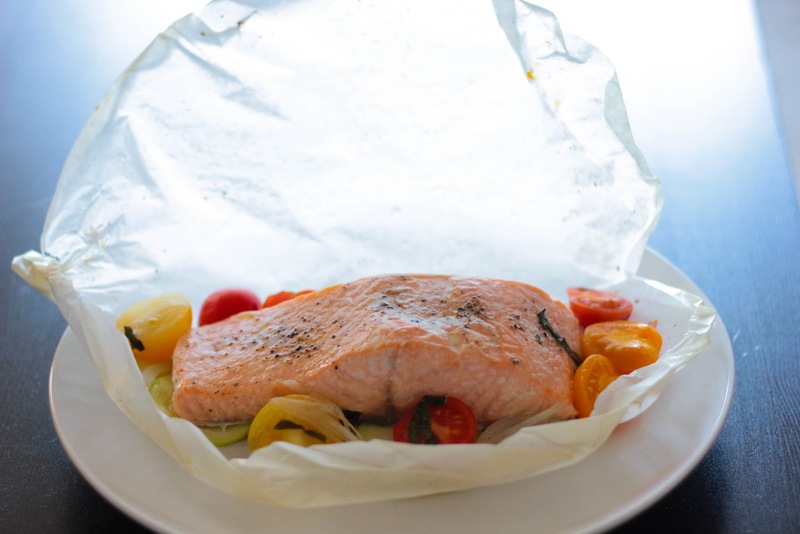 Papillote is a beautiful french word that means parchment, but sounds so much better. 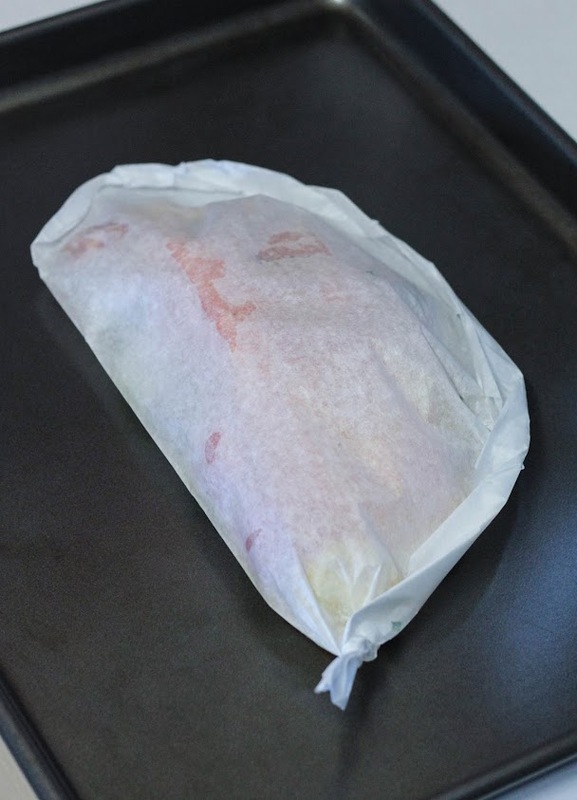 This cooking technique involves wrapping the food in a little parchment packet so it cooks in its own steam when you put it in the oven. It is super easy, super clean, super tasty and super healthy. So the other day I was looking through my food magazines in an obsesive look for healthy food and I found this recipe. Took like 20 minutes to make, of which at least 5 where for taking pictures. I started with some salmon, sliced zuchinni, some cherry tomatoes, half a shallot and fresh basil. 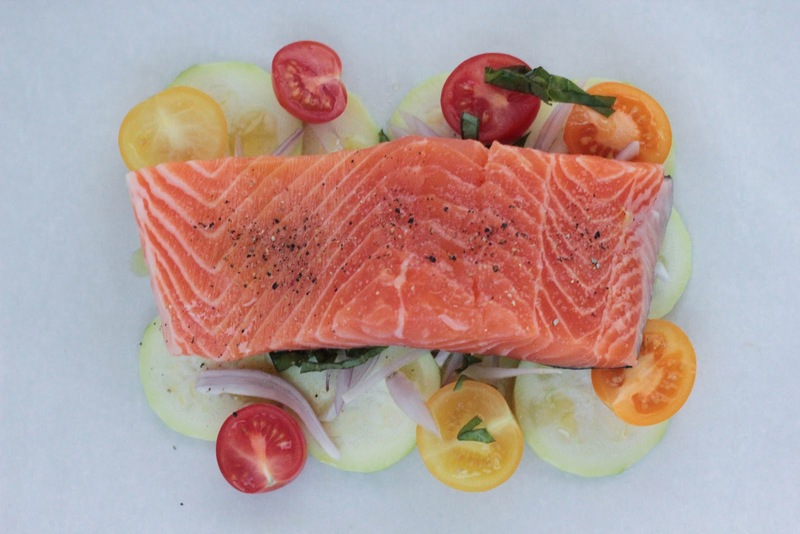 You can substitute pretty much any other fish and vegetables you like. I put it over a sheet of parchment, drizzled everything with olive oil and a splash of white wine, and seasoned it with salt and pepper. Then I had to close the packet and I had no idea how to do it. This video was really helpful! After 12 minutes at 400 degrees, tadaaaa, nicely cooked! From Bon Appétit, October 2012, serves 1. Place a square of parchment on a work surface. Layer the squash, tomatoes, shallot and basil over it. Season it with salt, drizzle with the wine and 1 tbsp of olive oil. 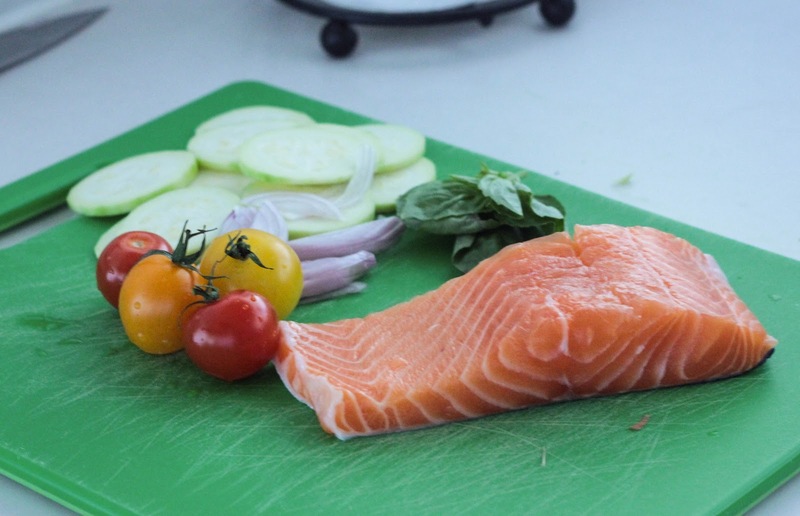 Place the salmon atop, season with salt and pepper and drizzle with 1 tablespoon of oil. Fold parchment over the mixture and crimp edges tightly to for a sealed packet. Put the packet on a baking sheet and place it in the oven for 15 minutes. Carefully open the packet and enjoy a tasty healthy dish. You can also do the papillotes with aluminium, it's easier to close and open and everything and it's cooked exactly the same way.